John Besford, the British and European backstroke champion, won the British backstroke title seven times from 1927-1936. He was a regular at the Olympic size Swimming Stadium pool and a member of the Brighton “Shiverers” Swimming Club. His most memorable feat happened in 1934 at Magdeburg in Germany. Hitler was so confident that his German champion, Ernst Kuppers would win the forthcoming European 100-metre backstroke championship that he intended to congratulate the winner personally. Hitler commissioned a magnificent bronze Eagle, weighing over a hundredweight and standing over twenty-eight inches high. This was to be called the Hitler Trophy and was to be presented to the victor of the race by him personally. John Besford won the race, by a whisker. Hitler was so annoyed and frustrated his champion lost that he refused to present the trophy to the Englishman and stormed out of the stadium. 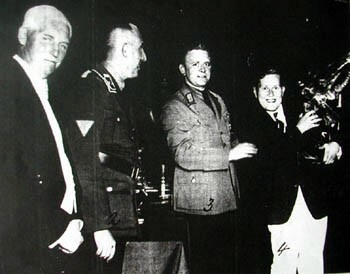 The Bronze Eagle was finally presented to him by one of Hitler’s officials and was brought home to England. The trophy sat on the mantelpiece of his Brighton dental practise in Davigdor Road for many years, although through the war years it was consigned to the loft. On his demise his son, John Besford JR, inherited the Eagle. John Besford JR is also a dentist and the Bronze Eagle now currently resides on the mantelpiece of his own dental practice in London. John was my mother’s elder brother. I was told the trophy was so heavy his team-mates rushed to help him when the SS guards passed it to him. Another story I remember him telling was how his silver cups and presentations took up so much room and effort at his home in Yokohama, Japan, that he had them melted down and made into a solid silver coffee table with the details inscribed on the surface! He was an officer during the War. Afterwards, he lived in China, teaching dentistry at Beijing University until Mao took power. He and my mother, who nursed soldiers, went to start a new life in Japan. He was ‘uncle’ to the British swimming team in the Tokyo olympics. His first wife was the swimming and archery correspondent for ‘The Telegraph’ and they have a yearly prize awarded…the ‘Pat Besford’ prize, which is rather important. Mother also told the story of how he and her other brother, Barny who was also a British swimming champion, would swim out to sea from Hove…….all day! Just disappear. Also I am led to believe he was the youngest ever Olympian in 1928 when he was 16. He was also in the 1932 Olympics – which might have interested Mr Hitler as he had broken the 100m world record. In the European Student Games, he was Victor Ludorum and apparently in the British Student Games he won all the events he entered including the diving. He had a reason for missing the 1936 games which escapes me now. I am sure this new insight will be of interest to you. A mistake…John was in the 1936 Berlin Games but missed the 1932 games. The said Eagle was siting on the mantlepiece in his Yokohama home and it was impossible for one man to lift it easily. That’s amazing for us both to spot this Peter. John owned a hospital and did rather well in Japan. He lived on Embassy Heights and was once in the news when his roof was found 20 miles away after a typhoon ! He was a well-known collector of the carvings which decorated samurai swords. He had all his silver trophies melted down and made into a coffee table with the awards engraved on the top. I’ve been looking into the history of the Swimming Club here at the University of Manchester, with the name John Besford appearing many times in the early 1930s. He was UAU Champion 1930, 1933 and 1934 and probably the years inbetween also (haven’t found these results yet). He was one of the first members of the University’s elite sportsmens club – the XXI Club http://www.xxiclub.org – and is listed on their member list as a ‘Sir’. “Doc” Besford as I knew him as a youth growing up in Japan, was my dentist. He had his office in the old Masonic Building. He was rather humble about his Olympic experience revealing only that once upon a time he swam in the Olympics. Being a competitive swimmer myself, I thought it absolutely fascinating that my dentist could have once been an Olympian and a swimmer at that! Though the article is written about his swimming history, I have to tell you that he was one of the best dentists I’ve known. Re comment by Ralph Johnson, we believe that John missed the 1936 games because he was doing his dentistry exams at Manchester University. He went to the primary school just round the corner from Victoria Baths.